Three Danish children and their parents have been snatched by pirates who hijacked their sailing boat in the Indian Ocean, Danish officials say. Denmark's foreign ministry said the children were aged between 12 and 16, and that two Danish crew members were also captured during the attack. 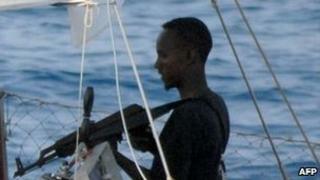 Pirates seized the boat on 24 February and were said to be heading to Somalia. Piracy is a highly lucrative trade in Somalia, where gangs can often demand millions of dollars in ransoms. As of last week, the EU's anti-piracy naval force said pirates were holding a total of 31 vessels and 688 hostages. Many of the vessels they target are cargo ships sailing near the Gulf of Aden - one of the world's busiest shipping lanes. The Danish foreign ministry said the ship sent a distress signal on Thursday, adding that "it has now been confirmed that the boat was hijacked by pirates". "It's almost unbearable to think that there are children involved and I can only sharply denounce the pirates' actions," Danish Foreign Minister Lene Espersen said. She said that the Danish government would do "everything in our power" to help the hostages. But Ms Espersen declined to provide further information about the pirate attack. "Past experience has shown that too much information and commentary (on hostage-takings) threatens to undermine the cause" of the hostages, the minister said. The Danes are the second group of non-commercial sailors seized by pirates in recent weeks. A group of Americans was seized earlier in February, and four of them were killed as the US Navy tried to rescue them. US forces say the pirates shot them. Analysts say the piracy industry is becoming increasingly lucrative - Somali gangs recently hijacked a tanker with $200m (£136m) worth of crude oil on board. International naval forces patrolling the area are becoming more willing to send in commando teams to free hostages. But the pirates also appear to be responding with increasing violence - two Philippine sailors were murdered last month by pirates angered at an attempted rescue.